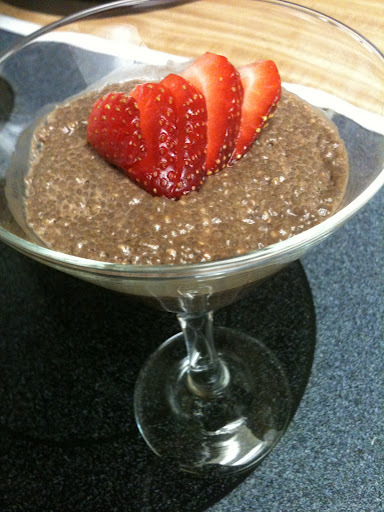 I love chocolate pudding and after hearing about a vegan pudding that used chia seeds, I immediately decided to buy some and try this chocolate chia pudding. 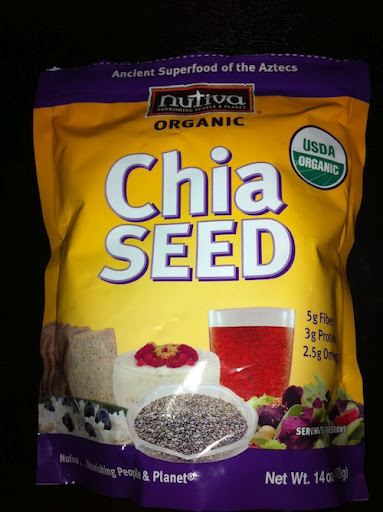 What I love about chia seeds are how nutrious and filling they are. Even though I really enjoy these puddings, especially since they are filling and much more nutritious than regular pudding, I enjoy the Chocolate Avocado Pudding which is much more creamy and still on the healthier side. But by far my favorite is the Dark Chocolate Mousse which is the creamiest and richest but not as healthy as chia or avocado, but definitely worth a tasty splurge! Ever since eating a vegan diet and no longer buying Swiss Miss, I have been trying different ways to use cocoa powder as a way to make hot chocolate. I know I could buy the vegan powders at natural food stores, but they can be pricey and I’d prefer to make my own. Plus cocoa powder is so versatile I could use it for hot chocolate, desserts, and adding a chocolate taste to other foods. Recently, I started using CocoCardio, which is cocoa powder, beet juice powder, and hibiscus extract. It might sound strange but it tastes like chocolate when you add a sweetener. It makes it a perfect addition to a hot chocolate that is even healthier than regular cocoa powder – it has tons of iron! After multiple attempts of creating a hot chocolate that was perfect, not too sweet but not too bitter. I finally discovered a recipe of the perfect ingredients for a delicious, sweet treat that’s vegan. Plus it’s made in the microwave which makes it quick and simple! In a regular sized mug, fill the mug with the almond milk. Heat for 1 minute. Add CocoCardio (or cocoa powder) and stir until most clumps are gone. (I usually have to press some of the larger clumps against the side of the mug with the back of the spoon to break them up better.) Heat another minute, watching carefully so it does not overflow. Stir. Add the maple syrup and vanilla extract, if desired. Stir and enjoy! What I love about this recipe is it is very adaptable. If you want a sweeter hot chocolate, add more maple syrup. If you want your hot chocolate to have extra chocolate flavor, add more cocoa powder. If you want a thinner hot chocolate, replace some or all of the almond milk with water. If you would like to buy CocoCardio, use my code: LWZ362 for a discount! It is so hard to find a healthy vegan granola bar that is gluten free too. 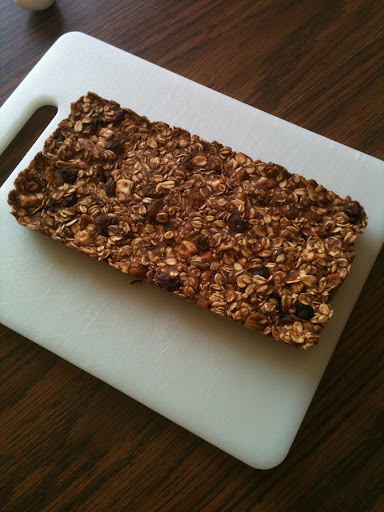 I came across a recipe online for homemade granola bars and I thought this was a perfect way to make simple granola bars AND I can control what these bars are made with. Any kind of nuts, seeds, dried fruit, or nut butter can turn these bars into a wide variety of flavors. After they are made all that needs to be done is for them to freeze, be cut into individual bars, and wrapped so they are ready to grab and go! 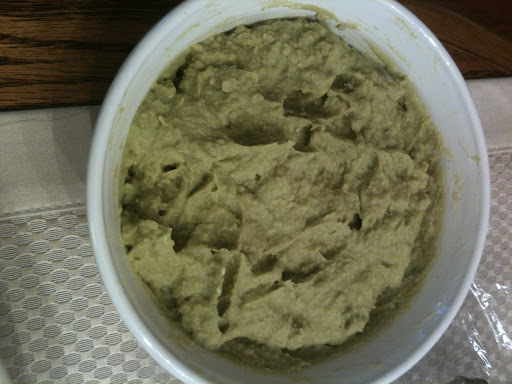 This recipe was adapted from this website. Line a 9×5 loaf pan with wax paper or foil. 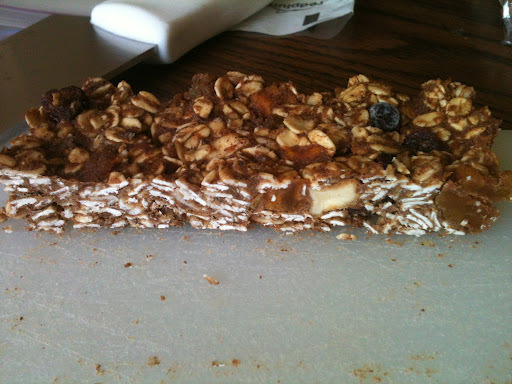 Make sure to leave the ends of the paper or foil sticking out so you can easily pull the granola out later. Press the granola mixture firmly into the bottom of the pan. Wrap each individual bar in saran wrap and freeze until ready to grab and go and eat! Note: These must be eaten frozen or thawed only for about 5 minutes. If they get too warm they will no longer hold together. After freezing for 2 hours, right before I cut the granola into individual bars. 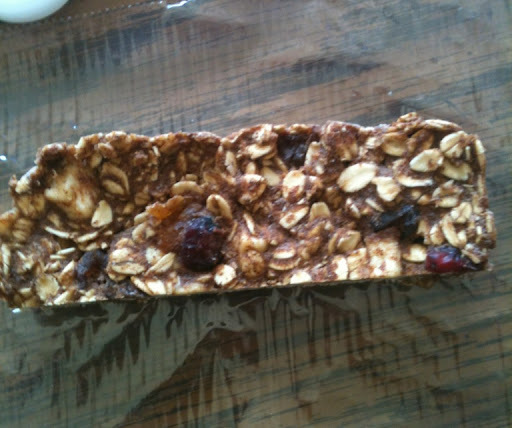 Here’s one of the individual bars, looks delicious! Here’s another individual bar, where you can see the side of it. 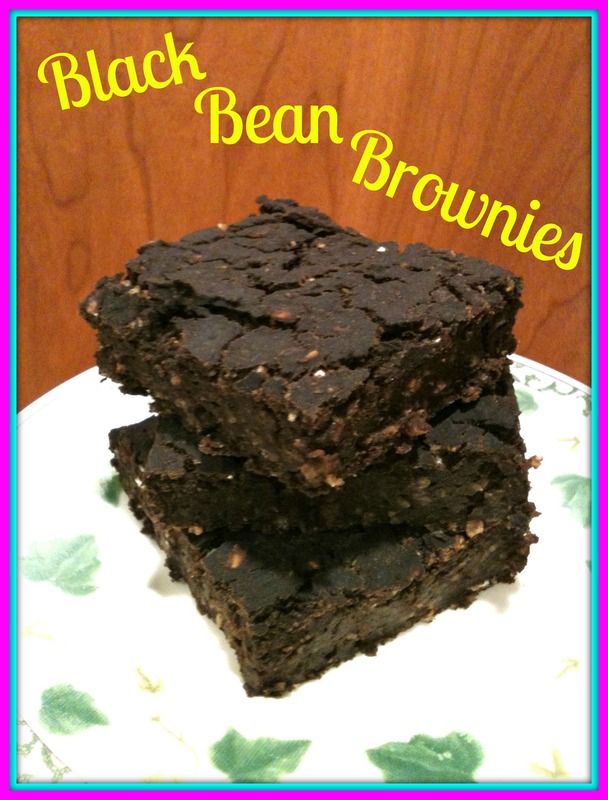 I have tried a few recipes of brownies made with black beans and this recipe is my absolute favorite. There is no flour or added sugar, just agave and the natural sugars from the bananas! In these brownies you can not taste the black beans, but you get a pretty strong banana taste (depending on the size of your bananas and how ripe they are) with a hint of chocolate. 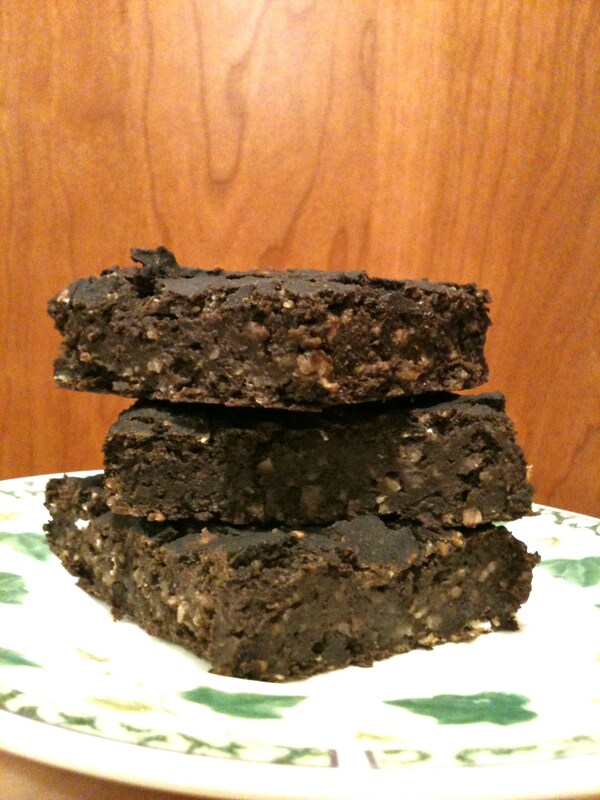 This recipe was adapted from Happy Herbivore’s Black Bean Brownies. Preheat oven to 350F and grease an 8×8 pan or line with parchment paper. Add the other ingredients excepts oats and blend until smooth, scraping sides as needed. 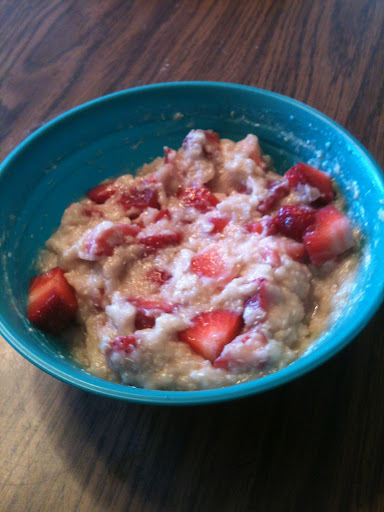 Stir in the oats with a spoon and pour batter into pan. Bake 30 minutes or until a toothpick comes out clean. Allow to cool before slicing. Notes: If you want fudgier brownies, use 1/4 cup less oats. And the white specks you see in my brownies are oats that didn’t get grinded all the way. If you don’t want any white specks, pulse your oats in a food processor until a complete flour consistency. The batter will probably also be smoother if you have a vitamix. The longer these sit, the more you will taste the banana flavor. If you can wait, try not to eat these until the next day for the best flavor! These also freeze well. I had one in the freezer and am too impatient to wait for it to thaw on its own so I reheated it in the microwave for 30 seconds and it still tasted quite good! This recipe yields 9 brownies. Based on not using the optional raw sugar, 1 brownie is approximately 112 calories and 4g protein. 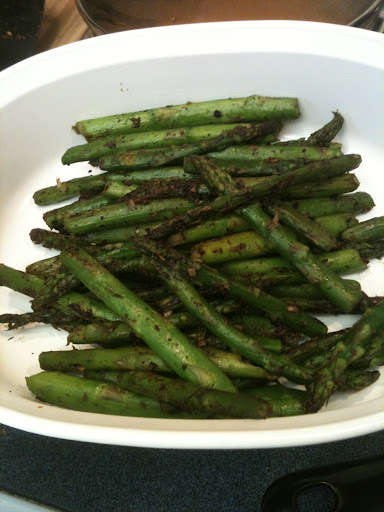 I love asparagus and normally I bake it so this was a fun, new and easy way to make some delicious asparagus! 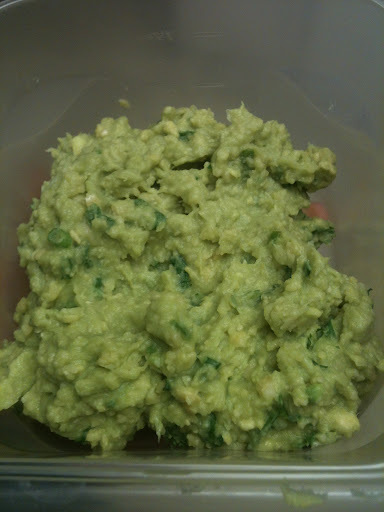 This recipe was adapted from the book “Appetite for Reduction” by Isa Chandra Moskowitz. Saute the ginger and garlic in the oil for about 30 seconds, then add thyme and a splash of water and let this sizzle for a few seconds. Add the asparagus, salt, and spices. Use tongs to toss and coat adding a few splashes of water if it seems dry. 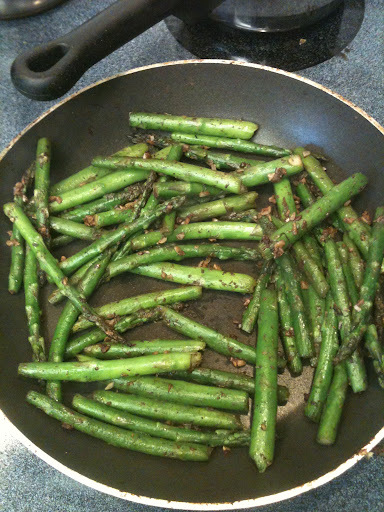 Saute for about 10 minutes or until the asparagus is tender. Note: For presentation, you can serve the asparagus with lime wedges. 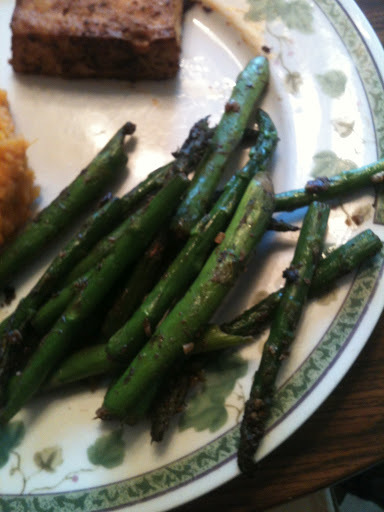 This was not all the asparagus I made, only half. This side was perfect with the other dishes I made for Easter Dinner: Broiled Blackened Tofu and Ginger Sweet Mashed Potatoes and Apples. 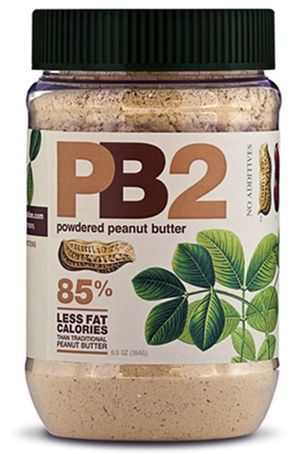 1 serving yields approximately 38 calories and 2.5g protein. These mashed potatoes were so sweet and went great with the other dishes in yesterday’s Easter dinner which also included Broiled Blackened Tofu and Jerk Asparagus. This recipe was adapted from the book “Appetite for Reduction” by Isa Chandra Moskowitz. 1 pound apples, peeled and cut into 1/2 inch pieces (I used 4 apples) Red apples are recommended and even though peeling is time consuming, it is definitely worth the time to make the mashed potatoes of the best consistency. Preheat a 4 quart pot over low heat and spray it with a nonstick cooking spray. Add the apples, sweet potatoes, water, and salt. These potatoes were delicious and very easy to make. I’ll definitely be making them again sometime soon. However, the sweet potatoes and apples in this recipe make a great combination and flavor that would be perfect as a side for Thanksgiving dinner! Tomorrow: The recipe for the Jerk Asparagus. 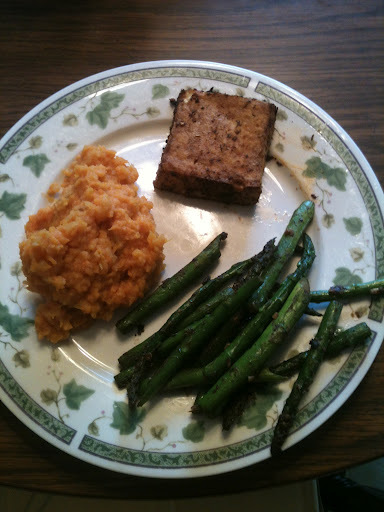 This year for Easter, I made my family a delicious vegan, gluten free dinner which consisted of Broiled Blackened Tofu, Ginger Mashed Sweet Potatoes and Apples, and Jerk Asparagus. 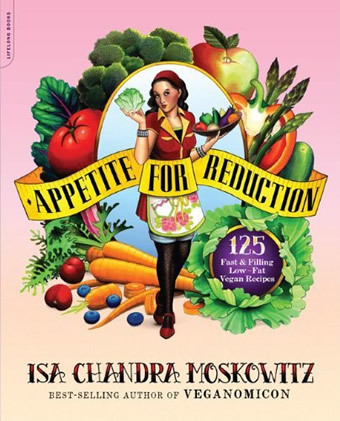 These recipes were adapted from the book “Appetite for Reduction” by Isa Chandra Moskowitz. I used 38 ounces of tofu (it was from a big package bought at Costco). The night before I froze the tofu then took it out to thaw this morning. (This is not necessary, but gives the tofu a chewier flavor.) Make sure to press the tofu before adding spices and broiling so it soaks in more flavor. Set up your oven so that the rack is 6 inches from the broiler. Preheat the oven to broil. Mix together the spices in a wide bowl and set aside. Mix together the sauce ingredients in a different wide bowl. Poke each slice of tofu with a fork a few times to help the flavors seep in. Place the tofu on the baking sheet in a single layer and bake under the broiler for about 12 minutes, flipping once about halfway through. 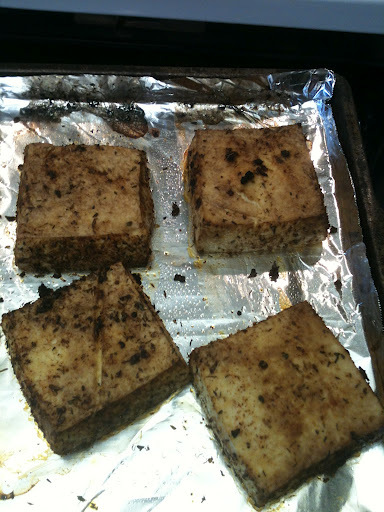 The tofu is done when it looks dark and black in some spots. 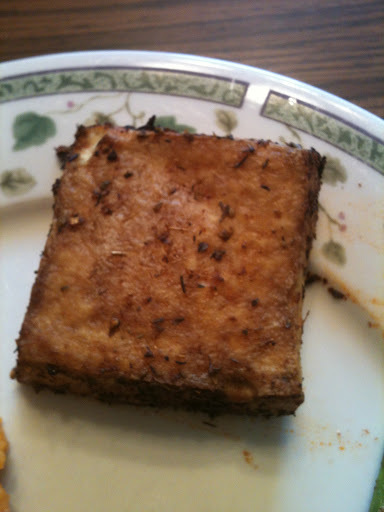 Note: Next time I make this, I am going to cut the tofu squares in half diagonally to form triangles. This will help add more flavor and crispness to the tofu. 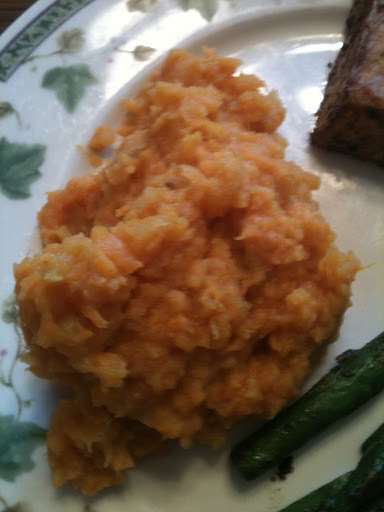 Tomorrow: Ginger Mashed Sweet Potatoes and Apples Recipe! 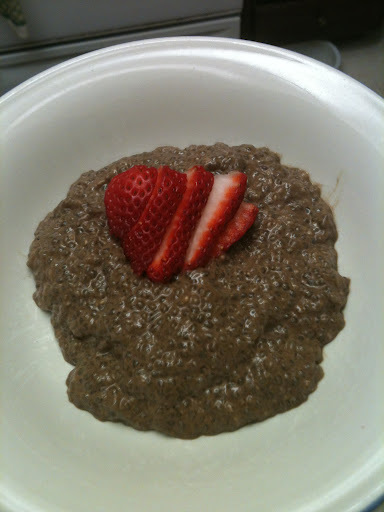 This was a yummy, filling breakfast with quinoa flakes and strawberries. This was a very quick breakfast to put together. I followed the directions on the back of the quinoa flakes box using almond milk instead of water and heated the quinoa flakes in the microwave. Then I mixed in the strawberries! I used to love mac and cheese, but haven’t had it since eating a gluten free and vegan diet. I have seen several recipes online that I have been meaning to try out for a while and I finally tried out this one last night. I followed the recipe exactly as directed except I doubled the recipe. Below are the directions to make a family serving of this delicious Butternut Squash Mac ‘n Cheeze which was adapted from Oh She Glows. Preheat oven to 425F. Line a casserole dish with tin foil. 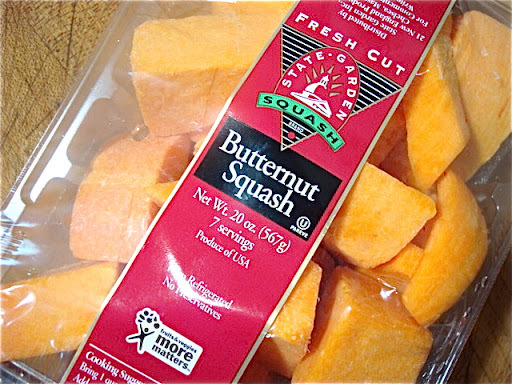 Mix chopped squash with 1/2 tbsp olive oil, salt, and pepper. Roast for about 40 minutes, uncovered, or until tender. Once the butternut squash has cooked and is cooling, prepare the cheeze sauce. In a bowl, whisk together almond milk and arrowroot powder (or cornstarch) until clumps are gone. Set aside. In a small sauce pan, add Earth balance over low-medium heat. Add almond milk and arrowroot powder mixture to the pot and whisk. 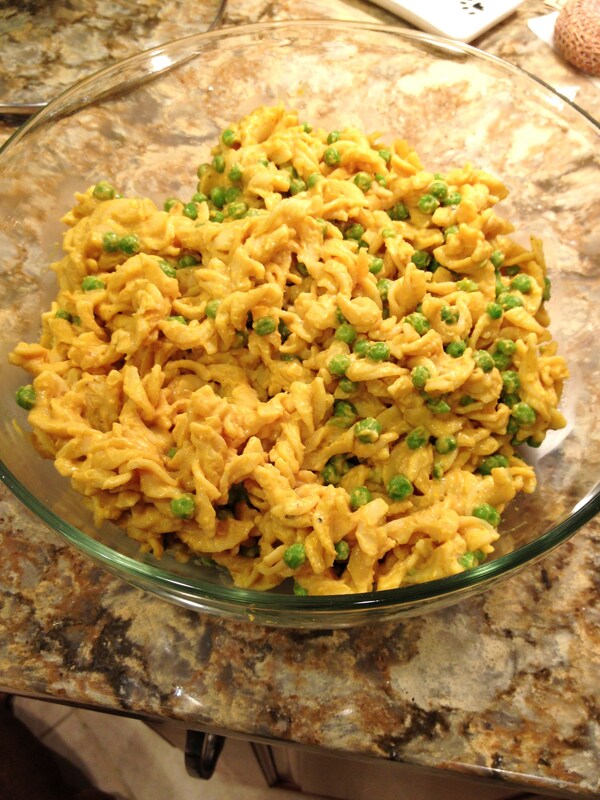 Stir in nutritional yeast, Dijon mustard, garlic, salt, and pepper and whisk over low heat until thickened, about 5-7 minutes. Begin to cook your pasta according to package directions. I’m definitely going to have to make this mac n’ cheeze again. It was very easy to make! 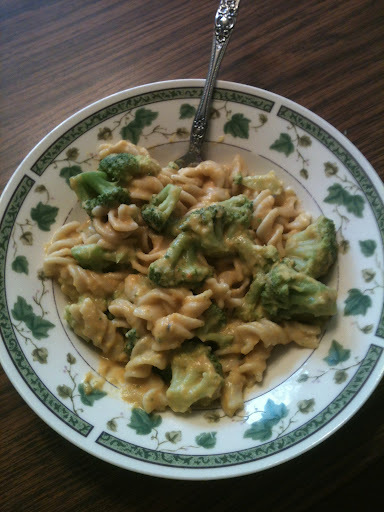 Update: For Mother’s Day I tried this recipe again but this time used fresh butternut squash and broccoli. 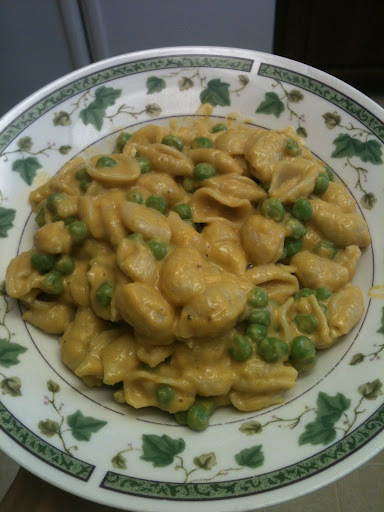 It was another delicious version of vegan mac n cheeze! 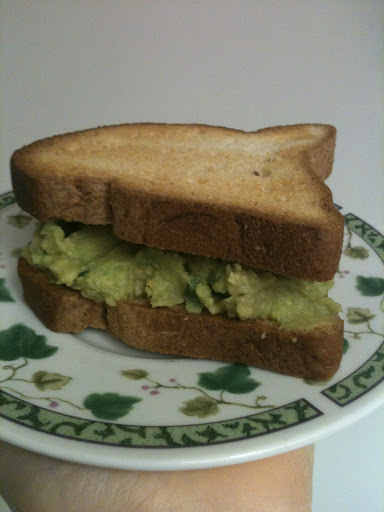 Although, I do prefer the peas over the broccoli for this meal.